Tens of thousands turned out in Tunisia to protest a mass strike planned by the country’s most powerful labor union, aimed at the stagnant economy and police abuses. Similar discontent toppled President Zine el Abidine Ben Ali two years ago. 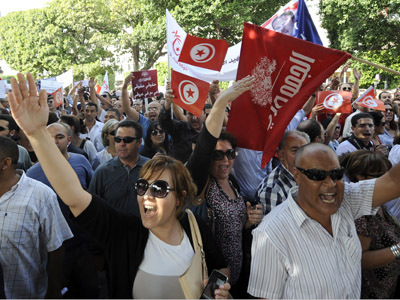 ­In the capital Tunis, hundreds demonstrated in front of the former headquarters of the RCD Party of ousted Tunisian President Ben Ali in a show of solidarity with the government. 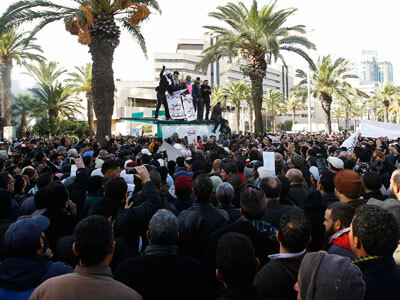 They held signs condemning corruption and the Tunisian General Labor Union (UGTT), a major opposition force in the country, local news website Tunisia-live.net reported. 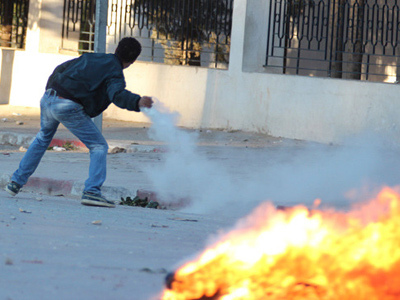 “We are here to demand a law in Tunisia’s new constitution that protects our revolution,” a member of the local committee in Kram of the National League for the Protection of the Revolution told the media outlet. ­The rallies across Tunisia were led by imams who urged the dissolution of the UGTT, as well as the implementation of the Sharia law, AP reported. The UGTT is set to stage its mass strike on December 13. The moderate Islamist ruling Ennahda Party and the Union are in opposition over economic problems, unemployment and reported police abuses. However, many hardline Tunisian Muslims criticize the Ennahda party for being too moderate.